I received product from Dexas International for the purpose of this feature, regardless all opinions are genuine. All photos contained below are copyright Momma Told Me Blog 2015. Momma Told Me: Fresh is seldom easy. Spring is finally here; while the 90 degree weather hit us in SoCal several weeks back, we've also been having several unusual overcast days. I don't mind so much, while they make photography a pain, they help the crops around us grow, and everyone knows California could use a few sprinkles as of late! Speaking of crops, my hometown is not only known for it's national production of produce, but for being the host of the largest annual Strawberry Festival. In high school I would walk along the fields of rich greens and red berries to get to our campus. Today, on the other side of the train tracks, a sea of fields stretches as far as the eye can see, until it is at last broken up by the sight of blue skies and protruding mountains. Not only can we enjoy the biggest berries and freshest product, but we can often take it home the same day it is harvested from the field. So, you can imagine there will be plenty of delicious salads on our table this season as we entertain, or simply enjoy an afternoon together. One of the biggest reasons we don't enjoy fresh salads more often is the lack of convenience in preparing them. 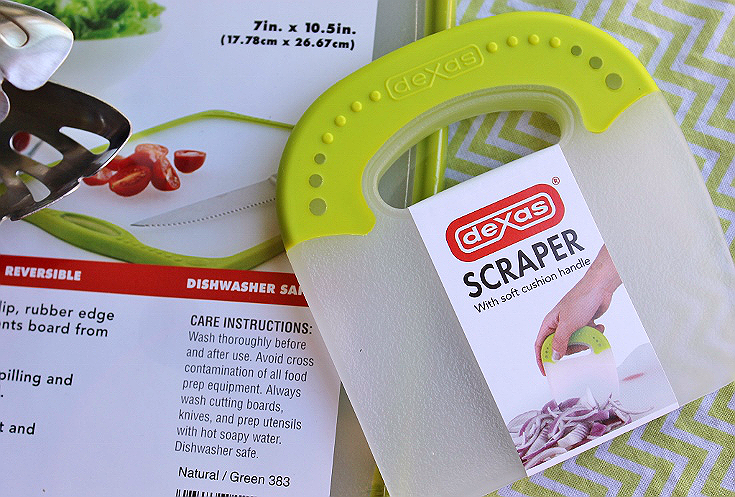 I was recently excited to discover some new Dexas International tools and kitchen gadgets that have made it easier than ever to get fresh fruits and vegetables on the table in record time with minimal cleanup. 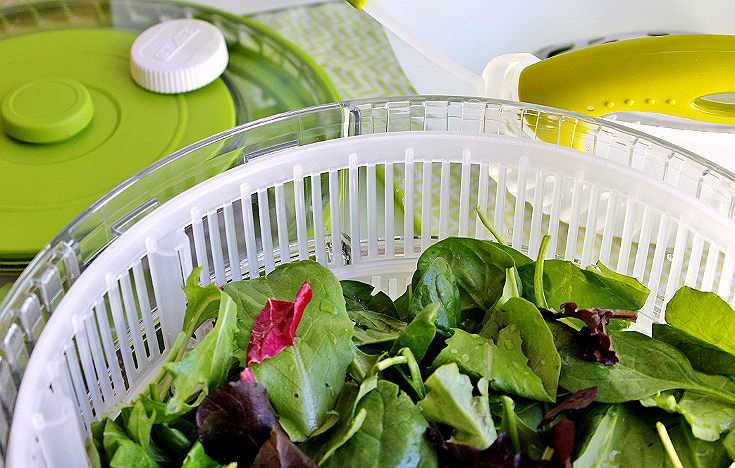 The Turbo Fan Collapsible Salad Spinner not only saves space when not in use, but expands to efficiently rinse and dry up to 4.5 quarts of fresh greens in seconds. The soft cushioned Dexas Scraper handle is easy to grip and made with the same versatile poly materials as my favorite Gripboard cutting boards. 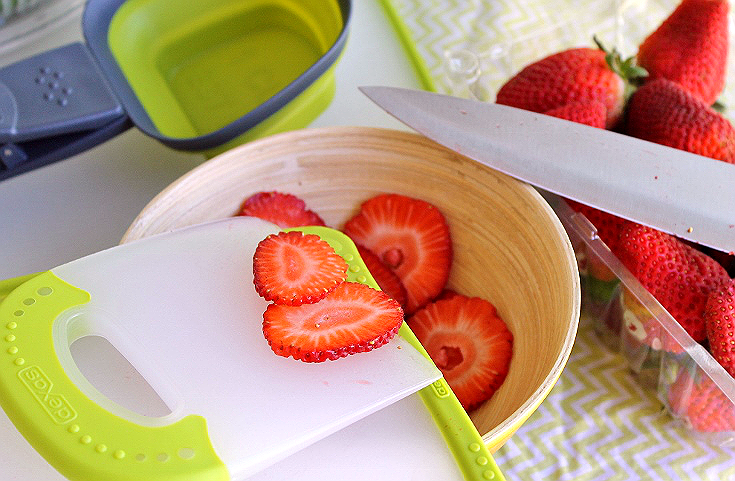 Not only are these stain and odor resistant, but they are impressively easy to clean, even when slicing the strawberries for my favorite Strawberry Fields Salad. The subtle raised edges and gentle grips also keep these boards from sliding during preparation, and help trap juices and liquids, preventing them from staining counters or making messes on other surfaces. Personally, I'm a fan of the small innovations that make life simpler- the KlipKup quickly tickled my inner hostess. It's generous 8oz capacity is perfect for chip dips, salsas, salad toppings, dressings, and more. I'd love to see it bundled with a small serving set of matching mini tongs and a serving ladle! My stainless steel spoon got some flak for being an inadequate serving device for the strawberry balsamic salad dressing, but I didn't mind because they matched my Spoon and Strain Serving Tongs just fine! During the warm weather months we eat a lot of salad 'meals,' and I rarely invest in bagged lettuce, as they tend to spoil much quicker than fresh produce. Thankfully our Dexas kitchen tools and gadgets make the process of preparing a fresh much simpler, and more stylish. Dexas has a full assortment of kitchen aids and innovations as well as school and office supplies all made with colorful, durable, and trendy materials. 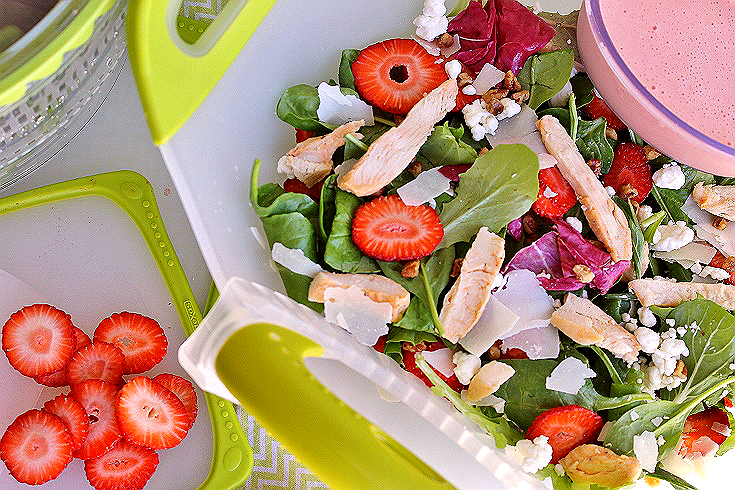 Grab our Strawberry Fields Salad recipe below and enter to win a collection of our favorite Dexas kitchen products. 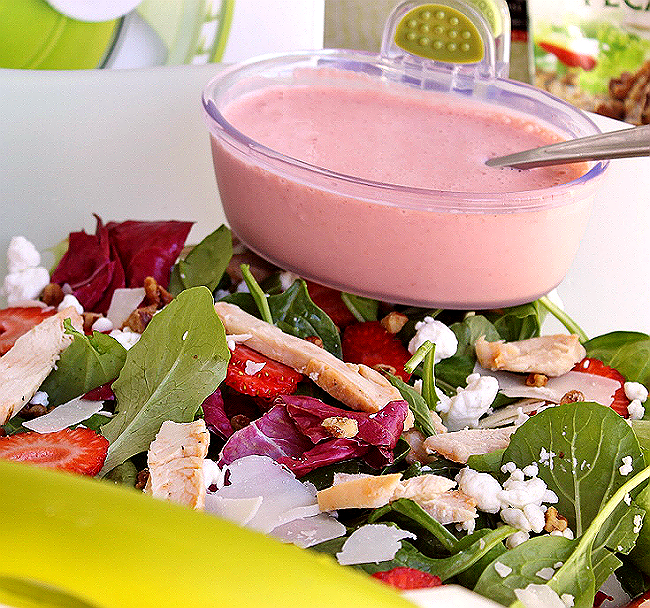 Do you have a favorite, or seasonal, salad you'll be enjoying this Spring? What Daughter Says: Take some of the work out of enjoying fresh fruits and vegetables with thoughtful kitchen tools. Enter to win a Dexas Prize Pack valued at $100, below, then continue hopping along to the other Blog POP! Spring Fling Event giveaways with the LINKY found here. 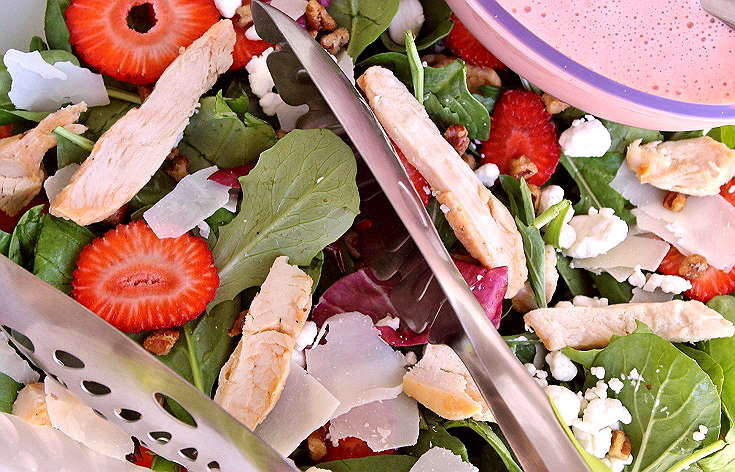 ***Click for printable strawberry fields salad recipe. 1. )Puree strawberries in blender/processor, until smoothe. 2.) Add Lemon Juice, Sugar, and Yogurt. Process until evenly blended. 3.) Introduce Oil and Vinegar Slowly, allowing pauses to blend. This will help combine the ingredients and thicken the texture of the dressing. Layer the ingredients beginning with a light drizzle of dressing on your plate. Scatter a thin layer of Baby Spinach and 50/50, where Baby Spinach is predominant. Crumble Feta and sprinkle Parmesan lightly. 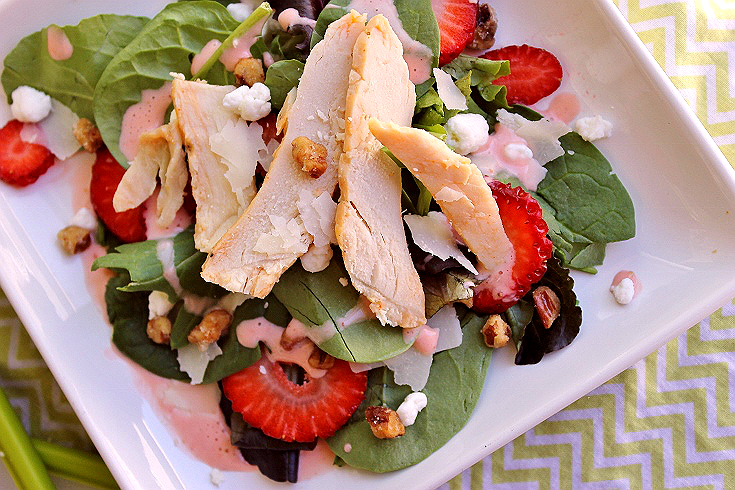 Add a layer of thinly sliced strawberries, with a light drizzle of dressing, add candied pecans if desired, and repeat. Top second tier with thinly sliced Chicken Breast. 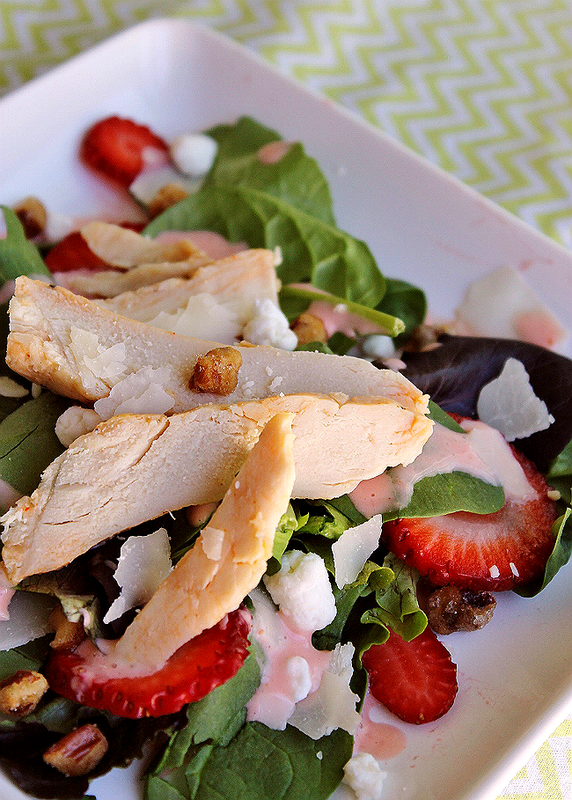 Serve with a carafe of chilled Strawberry Balsamic Dressing. Enjoy! I would like the PIZZA CUTTER ROLLER. I'd love to have the Lemon Cutting & Serving Board, it's the cutest cutting board I've ever seen. I like the salad spinner! I would like to have the tortilla warmer. I would like to have the Adjustable Pet Feeder for my older dog. I love the easy to use designs of their items, my favorite is the salad spinner. I'd like to have a Pinch Mitt, or the Pot Handle Holder. I want the CHOP & SCOOP 11" X 15" SOLID RED! Seriously could use it! I would also love to have the Clipcase 2 storage clipboard....it would be very useful. I would love to have the SNACK-DUO WITH COMPANION CUP! This is perfect for my kiddo's to grab and go when we drive anywhere. as soon as we drive for five minutes, someone wants either a snack or a drink, so this would solve the problem! I would love new cutting boards! I would love the 2-CUP COLLAPSIBLE MEASURING CUP. I would love the pizza cutter roller! I would love to have the collapsible 10" Pop Colander, it would really come in handy in my kitchen. The collapsible measuring cup is awesome! I would love the collapsible strainer too! Awesome stuff! I like the double elevated feeder for pets. I think it would be great for my cat Nienna! Thanks for the chance. 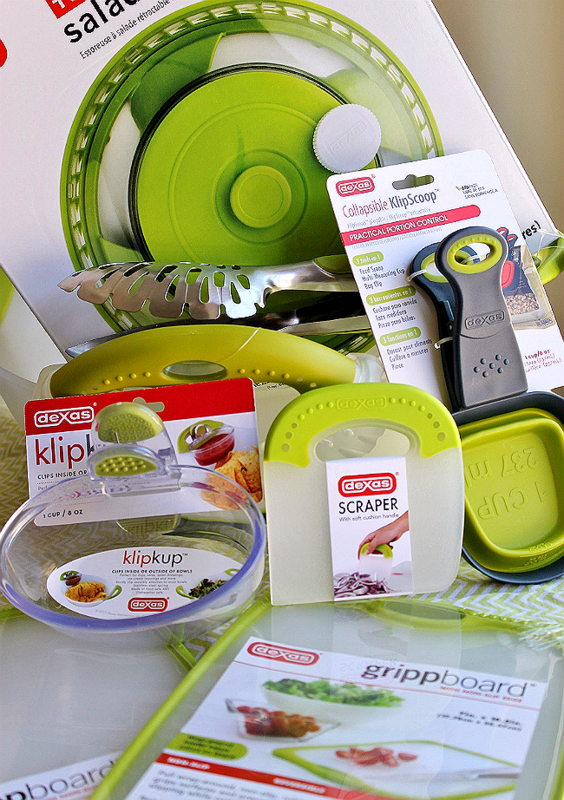 I like the 2 cup collapsible measuring cup and the 4" Santoku knife with Lemon patterned blade. Love the color. Love the collapsible measuring cups! I like the Nibs Cutting Board. I like the over-the-sink strainer gripboard. I like the chop and scoop cutting board. I would really like the collapsible measuring cup. How clever. BUCKET OF GADGETS IS SOMETHING I WOULD LIKE. I would love to have the Collapsible 10" POP Colander. I really like the 2-CUP COLLAPSIBLE MEASURING CUP. I would love to have their Bucket of Gadgets. They look pretty nice. I like the 'Collapsible KlipScoop™' and the pet bowl grip mat. One Dexas item I would get a lot of use from is their Tortilla Warmer. It's on my wish list now! I'd like the Clear Knife Block! What a cool idea! I would love the 8 in. spatula. I would love to have the clear knife block! I would love to own any of the products! Something I could really use is the See-Through Drawer Knife Block. I like the extra large ice cube trays, I think they'd be great for freezing homemade stock. The LOOM CASE LAPCASE looks really cute. I want the Collapsible Pet Feeder! Actually, really need a salad spinner. The one I have is a "family heirloom" meaning my sister was going to throw it out..got to be 15 years old...looking to upgrade. I also like the ice cube trays. I like the 2 Pack XL Cube Ice Tray - would be good for freezing herbs. I definitely could use a good salad spinner. the collapsable measuring cup and the bucket of gadgets would be awesome! 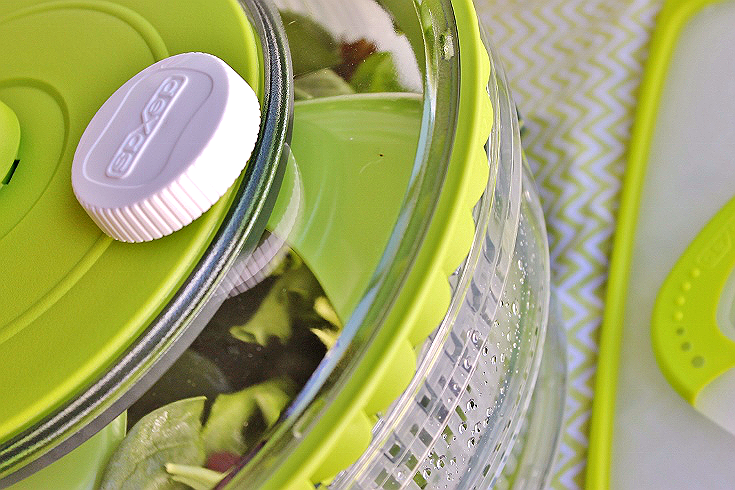 The TURBO FAN COLLAPSIBLE SALAD SPINNER is awesome! Anything COLLAPSIBLE is Great in my book! Thanks for sharing! I would love to have the OVER THE SINK CONTOUR GRIPPBOARD®. I really would enjoy having one of those since I love to cook. Id like to have the chop and serve cutting board. I would love to have the cookbook holder!! I'd also like to get the collapsible kennel bowl for my dog. I would love the Loom Case Lapcase to use for my crafts, thanks! Id like to have the slim case 2 so I could keep all my daughters important papers in. The collapsible pet bowls are really cool! I'd love to get the spoon rest and the Spoon & Strain™ Tongs. I'd love the 4" Santoku knife with Lime patterned blade. I'd like the tortilla warmer. I would also love to have the Popware For Pets for my dog and cat. An egg/strawberry/mushroom slicer that's durable would be nice to see in their line.